Communications links are so ubiquitous these days that we pretty much take for granted the ability to connect to the Internet and to other people. How many times have you been in public and heard someone have a fit because she couldn't get a good enough signal to make a call? It requires the person to get up and walk a few feet or maybe turn her chair in another direction to get an extra bar on the iPhone. How inconvenient. Even when placing a call to Hawaii or Alaska the expectation is that things just work. In 1963 when this tropospheric scattering network was installed for linking Alaska to the lower 48 states, satellite communications was still in its infancy and coverage was not even close to global. Even radio relay towers were relatively scarce across the landscape. We've come a long way, baby. One of the first high-capacity commercial tropospheric scatter systems to go into operation will shortly bridge the icy coastal waters between Annette Island, Alaska, and Vancouver Island, British Columbia. Tropospheric scatter relies on the fragmentary refraction of microwaves back to earth by the troposphere - the turbulent layer of atmosphere extending up to six miles. 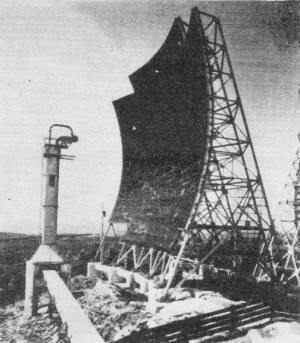 This type of radio propagation requires very high power and huge transmitting antennas which beam a signal just over the horizon so that refraction occurs several miles above the earth. Highly sensitive receiving equipment is necessary to reconstruct the transmitted signal. 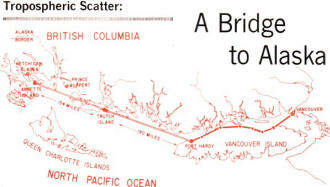 The tropospheric scatter network has two legs with a central relay as shown by the map (the link from Port Hardy to Vancouver is conventional microwave). Each antenna - see photo at right - weighs 70 tons and is built of galvanized steel sheets to take winds up to 120 m.p.h. 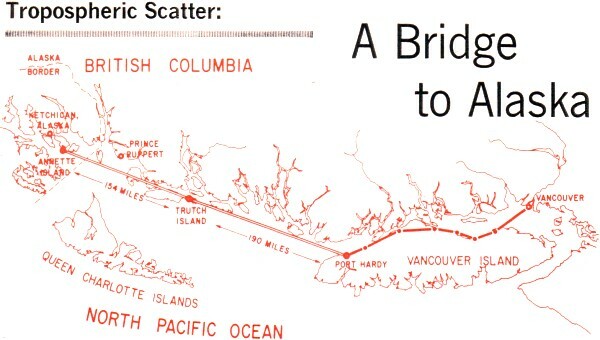 As shown in the map above, the Annette-Port Hardy link required use of a central relay located on Trutch Island. The system includes two transmitters, four receivers and two antennas - 70-ton, 60-foot-square monsters - at Annette and Port Hardy, and four transmitters, eight receivers, and four antennas at Trutch Island. The $5 million, 344-mile link provides 240 channels for voice communications and data transmissions. 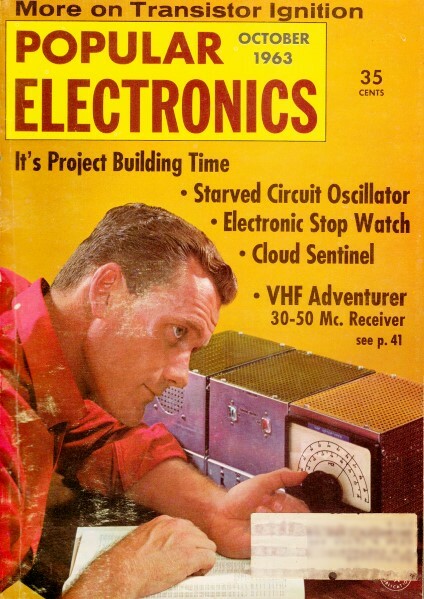 At Vancouver Island, a conventional 275-mile microwave radio system connects with the city of Vancouver and telephone circuits to the United States. The installation at tiny, storm-tossed Trutch Island, which is manned on a 24-hour basis, necessitated the formation of a community with all utilities for 27 people.